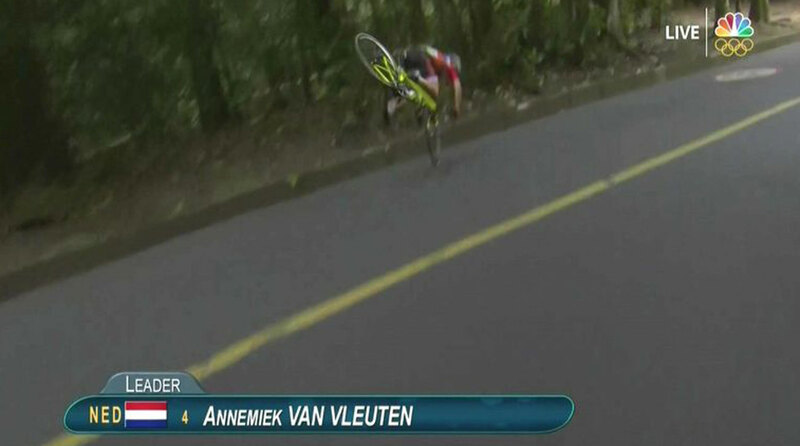 While leading the women’s road race competition with under seven miles to go, Dutch cyclist Annemiek van Vleuten crashed heading downhill. Van Vleuten was leading the 85-mile race at the time. The Dutch Cycling Federation announced she was conscious following the accident and headed to the hospital. Van Vleuten was later diagnosed with a concussion and three spinal fractures, according to Dutch outlet NOS. She is in the hospital in intensive-care. Cameras captured the crash, which happened as she went around a curve, careening into the curb headfirst and laying motionless. Russia's Evgeny Tishchenko (top) and Italy's Clemente Russo wrestle as they fall during a quarterfinal boxing match. Cameroon's Abdoulkarim Fawziya takes a fall during A women's qualifying volleyball match. USA guard Paul George falls into the stands during a game against Australia. Japan's Koji Yamamuro falls from the pommel horse during the men's team final. Alexander Naddour of the United States falls while competing on the floor during the men's team final. Argentina's Manu Ginobili falls to the floor as he chases a loose ball against Nigeria. France's Alexandra Lacrabere falls over after being knocked by Russia's Anna Sen.
Marcio Appel of Brazi slips but avoids falling off of Iberon Jmen while competing in the equestrian eventing cross country phase. Yusleidy Mariana Figueroa Roldan of Venezuela falls as she competes in the 58kg weightlifting competition. Britain's Claudia Fragapane falls while competing in the qualifying for the women's Beam event. Hongxia Li of China falls after diving to shoot at goal during field hockey. US gymnast Christopher Brooks falls while competing in the qualifying for the pommel horse. Taiwan's Tan Chi-Chung falls as he competes during the men's 56kg weightlifting event. Officials react as Italy's Myriam Fatime Sylla crashes into seating after failing to reach a ball during a volleyball match. Chunsong Shang of China falls while competing on uneven bars. Fabiana of Brazil falls while Jonna Andersson (20) and Kosovare Asllani (9) of Sweden fight for the ball. Germany's Mats Grambusch falls during a field hockey game against Canada. Lithuania's Jonas Valanciunas (17) and Brazil's Nene Hilario (13) crash to the floor as they scramble for the ball. United States center Sylvia Fowles falls over Senegal forward Mame Marie Sy. Rene Pranz from Austria falls as his competes with Guilherme Toldo from Brazil in an Individual Foil Fencing match. Brazil's Michel Borges falls as he fights Cameroon's Hassan N'Dam. Serena Williams off her feet while facing Daria Gavrilovaof Australia. Brazil's right back Jose Guilherme de Toledo falls during the a handball match against Poland. Poland's Michal Daszek falls during a Group B handball match. Mirco Scarantino, of Italy, falls back during an unsuccessful lift in the 56kg weightlifting competition. Turkey head coach Ekrem Memnun falls to the ground in reaction to a missed play during a women's basketball game. Argentina's Perrin Ignacio (left) and Thailand's Amnat Ruenroeng fall during a lightweight 60-kg boxing bout. American Mara Abbott passed her to take the lead after the accident, but finished fourth. Another Dutch rider, Anna van der Breggen, finished first.